CPDDBLOG wishes you a Happy New Year 2012! In follow up to prior posts on substance abuse during the holidays, New Year’s Day emergency room visits related to underage drinking, and the association between alcohol abuse and organized team sports, this post focuses on alcohol-related fatalities in association with high profile professional and collegiate sporting events. A number of such events including football playoff and bowl games are scheduled to occur over the next few weeks. 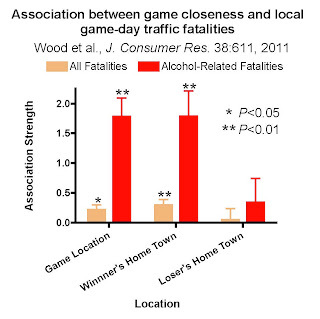 An article published by Wood and colleagues this month in the Journal of Consumer Research entitled “ The Bad Thing about Good Games: The Relationship between Close Sporting Events and Game-Day Traffic Fatalities”, reported what appears to be a remarkable link between the competitiveness of such sporting events and traffic fatalities. The study analyzed data from 271 events including 7 Super Bowls (2001-2007), 37 NBA Finals games from 2001-2007, and 227 NCAA football and basketball high-stakes games taking place from 2001-2008, including regular season games involving teams with established rivalries as well as tournament games (e.g., the Bowl Championship Series and the Final Four). The study reported that highly competitive events (e.g., those either close in final score or those subjectively rated “close” by a panel of sports experts on a 5-point “closeness scale”) were more likely to be associated with more game-day traffic fatalities. Moreover, the associations were substantially enhanced when alcohol was involved. 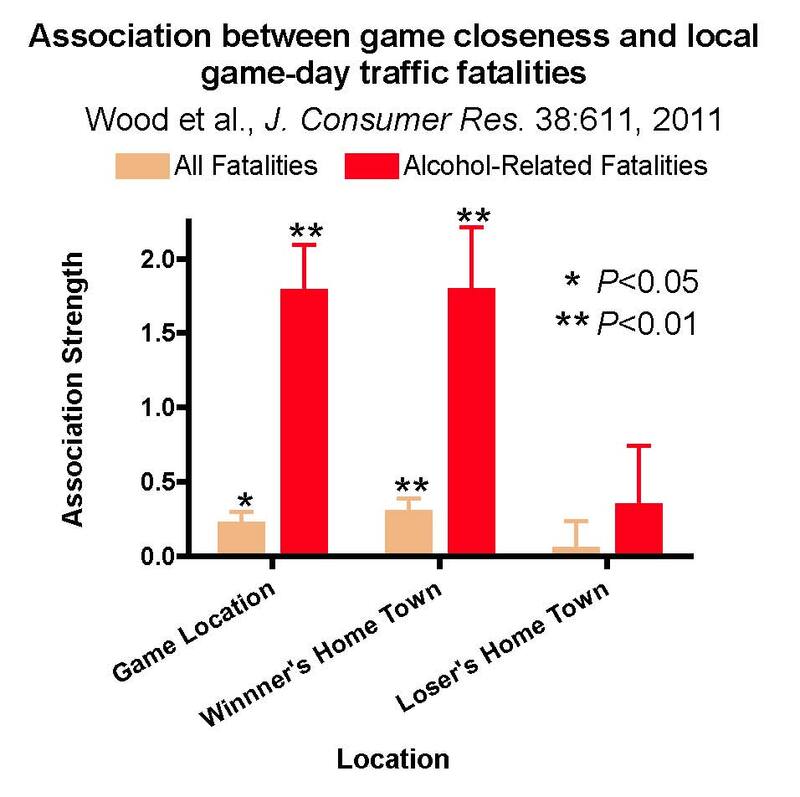 The phenomenon was quite localized such that game-day traffic fatalities (including alcohol-related fatalities) were not increased in losing team hometowns, but only in winning team hometowns and in game locations (where many winning team fans would be). Overall, the authors reported a 33% increase in risk for traffic fatalities at game locations and in winning team hometowns in association with “nail-biter” versus “blowout” games. The authors speculated that their findings may be related to changes in spectators’ testosterone levels, based on research showing that highly competitive sporting events increase and decrease testosterone levels in fans of winning and losing teams, respectively. They cited a study published in Drug and Alcohol Dependence showing that higher testosterone levels can result in more aggressive behavior. If increased post-game testosterone levels lead to more aggressive game-day driving behavior, this could result in more fatal traffic accidents, especially in those consuming alcohol. The effects of abrupt testosterone increases on driving performance remains to be characterized as the only study assessing effects of testosterone on driving simulator performance involved chronic testosterone administration, and it failed to detect any significant effects. While the Wood et al. report has a number of limitations, it certainly suggests that additional studies should be undertaken to assess effects of close competitive sports matches on driving fatalities, to determine whether steps could be taken to reduce excess traffic deaths in association with sporting events. By Alexandre B. Laudet, Ph.D.
‘Recovery’ is increasingly becoming the guiding vision of substance abuse services and policy. SAMHSA (funder of publicly funded services) is promoting the multi-system Recovery Oriented System of Care (ROSC) model and both the President’s Drug Strategy and the Department of Education are calling for the expansion of recovery supports across community-based settings. In this context, Recovery is understood as an ongoing process through which one achieves abstinence, wellness and improved quality of life. Having devoted the past decade of my research career to elucidate the recovery experience, I could not agree more. As I noted in 2007, most scientific articles whose title bears on recovery actually measure only short-term abstinence. 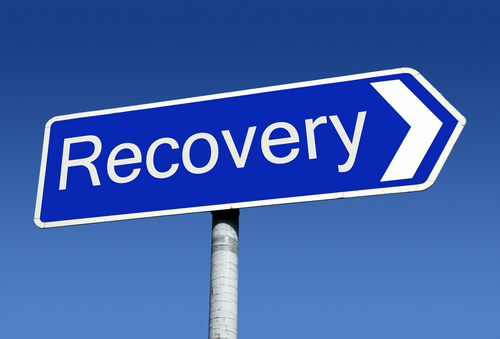 Here are highlights of a monograph detailing some key obstacles to building the necessary science of recovery, based on our experience seeking NIH funding for recovery oriented studies. The NIH funding process has historically favored relatively short-term evaluations of professionally driven interventions designed to reduce symptoms among individuals recruited in limited settings- i.e. treatment. That is, addiction research has mirrored the substance use service delivery paradigm that uses an acute care model to address a chronic condition. The approach isn’t optimally suited to promote/support recovery, nor is it adequate to build the evidence basis needed to inform recovery focused services and policy. - Recovery support services are ‘non-clinical’- i.e., often peer driven and organically developed; reviewers’ requests for manualization and fidelity of interventions are challenging to address. - Sample representativeness (external validity) is difficult to address because of the lack of data on the exact size, demographics, clinical history and recovery path of recovery community. Treatment population data are inadequate to infer the representativeness of a recovery sample but often the best we currently have. - Specifically what are the key ingredients of recovery- abstinence plus what? - How do we measure this for services’ internal monitoring and external accountability purposes? - How is recovery attained when treatment isn’t sought? - Which services/supports are needed at which stage of recovery and by whom? - How effective and cost effective are the various forms of recovery supports? - How can recovery supports be better integrated in primary health care settings and community based venues? Where are they most effective? - How can we harness the strength of the recovery community to build a workforce of recovery supports as healthcare reform will identify/insure more individuals needing services? - What constitute barriers to recovery and to seeking recovery supports – especially stigma, policy and lack of awareness that recovery is attainable? Elucidating and promoting a wellness process that unfolds over years, organically, in the community, requires that we ask different questions, using different methods and measuring different outcomes than when studying short-term, professionally driven symptom reduction interventions delivered in specialty care settings. There’s no urine tox screen for recovery…That does not mean scientific standards ought to be compromised but the boundaries of science must be expanded to allow for wellness processes to be understood. We owe the nation a scientific basis to inform recovery-oriented services and policy. WAIKOLOA, HI – The 2011 NIH Institutes Update for the American College of Neuropsychopharmacology (ACNP) was held Sunday afternoon, December 4. The session was introduced by ACNP President Dr. Eric Nestler, who noted that ACNP was fortunate to have a larger panel of presenters than usual, including representatives from 5 National Institutes of Health (NIH) Institutes. Panel members were Dr. Neil Buckholtz, Chief of Dementias of Aging Branch, National Institute on Aging (NIA), Dr. Thomas Insel, Director, National Institute of Mental Health (NIMH), Dr. Story Landis, Director of the National Institute of Neurological Disorders and Stroke (NINDS), Dr. Kenneth Warren, Acting Director of the National Institute on Alcohol Abuse and Alcoholism (NIAAA), and Dr. Susan Weiss, Acting Director, Office of Science Policy and Communications, National Institute on Drug Abuse (NIDA). Dr. Buckholtz began the session by speaking about NIH funding in general, noting that while NIH currently is working with a continuing resolution budget from Congress, there is hope that a budget appropriation will occur this calendar year. He also noted that the lack of an agreement by the Congressional Supercommittee could trigger an 8% budget cut for all of NIH in fiscal year (FY)2013, if nothing is done to avert that cut. He indicated that while the news appears grim, that NIH Institutes have funding to support research projects and he encouraged researchers to continue to submit grant applications, a comment echoed by subsequent panelists. Key initiatives for NIA include developing and implementing new diagnostic guidelines for Alzheimer’s Disease including guidelines for preclinical research studies, focusing on biomarker studies, supporting translational research, and working with other NIH Institutes to add aging-relevant research initiatives to existing studies. Next, NIMH Director Dr. Thomas Insel spoke about budget challenges facing NIMH, which in FY2011 awarded the lowest number of research grants (465 new and competing continuation applications) since 1998. This amounts to a 16% success rate, an all time low. 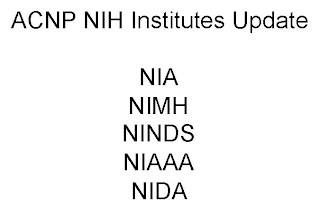 He noted that NIMH anticipates increasing the number of FY2012 research grant awards to about 500 (7.5% increase). Dr. Insel spoke about the downward trend in research grant success rates since 2002, due primarily to increased numbers of submissions in the face of stable and declining budget appropriations. 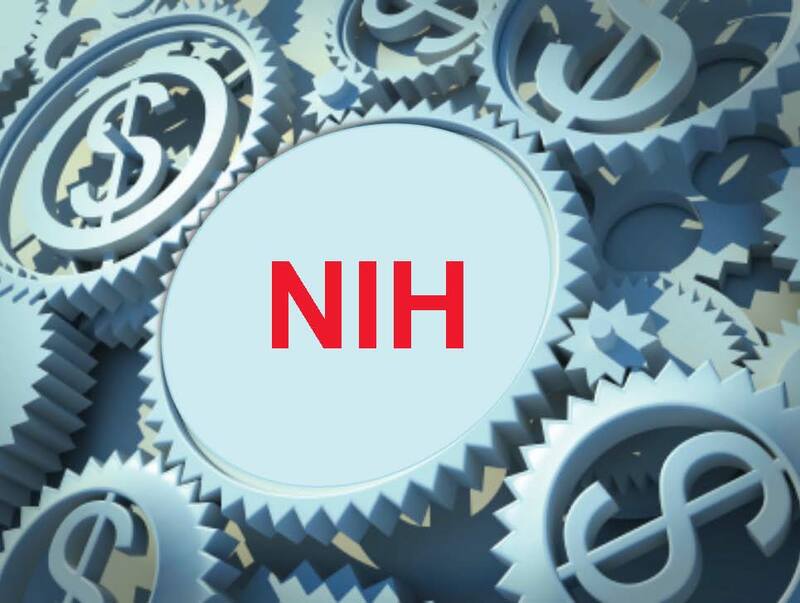 He noted that the NIMH funding strategy is designed to protect early stage investigators, fund innovative ideas, fund research project grants, and will reach to fund ideas that peer review committees did not quite get right. Key NIMH initiatives include the STARRS study assessing suicide in the military, with over 25,000 people currently enrolled, a project assessing recovery after a first break in schizophrenia (RAISE), and a biomarkers project (EMBARC) assessing biomarkers of major depression and treatment response. NIMH also is interested in medications development research, particularly now that big pharma is withdrawing from this research area. It is revamping its intramural research program with new facilities and with a translational focus. NIMH is inviting extramural scientists to help build this program by doing an intramural sabbatical. NIMH also is working to develop the next generation of leaders by fostering development of MD/PhD young investigators. NINDS Director Dr. Story Landis reported that research project grant (RPG) success rates at her Institute were about 20%, with an increase in the number of RPGs awarded in FY2011 (749) versus FY2010 (699). Early stage investigators were funded up to the 25th percentile. She indicated that NINDS is working to find a better balance between basic, clinical, and translational science and is focused on retaining medical resident researchers. Dr. Landis discussed an important point in therapeutics development research: many studies cannot be independently replicated, as reported recently. This is resulting in a higher proportion of failed clinical trials than in past. Accordingly, NINDS is focusing on improved experimental design including structured data analysis protocols, as well as on replication studies, to reduce the likelihood of late stage drug development failures. Related to this issue, NINDS is supporting NeuroNEXT, a program that standardizes clinical trial conduct and management. Dr. Warren, NIAAA Acting Director, spoke next and noted that FY2011 was a very tight year budgetwise, with a total appropriation budget of $458 million. NIAAA funded 150 new and competing continuation awards, with total funding of 685 projects in FY2011. Dr. Warren reported on a number of goals for NIAAA including development of additional treatment medications and medication combinations, development of better phenotypic animal models, and improvement of human laboratory paradigms. Dr. Warren also indicated that NIAAA is very interested in identifying additional cellular targets for alcohol (e.g., proteins/receptors/intracellular sites). Other key initiatives include development of an adolescent alcohol use disorder screening guide with questions tailored for different age groups, and support of longitudinal studies in children and adolescents aged 12-21 to determine effects of adolescent alcohol abuse on brain development. Existing cross-sectional studies in this area have linked adolescent alcohol use to brain structural abnormalities, but longitudinal studies are needed definitively establish a link between alcohol exposure and brain changes. 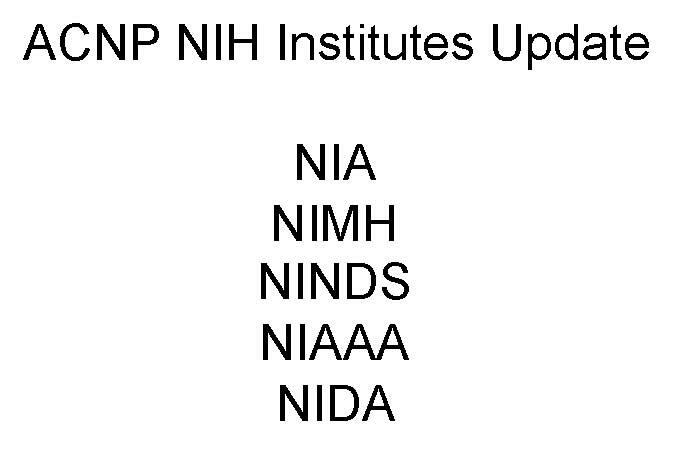 Dr. Warren ended his presentation by summarizing the status of the structural reorganization of NIAAA and NIDA, which he noted actually is more than a merger of the two Institutes, since up to 8 Institutes may be involved in the process. He noted that the initial time table for the reorganization had to be abandoned to accommodate the complexity of the process, which includes developing a strategic plan for substance use and addition research and conducting a research portfolio analysis. The current time table proposes that the strategic plan and portfolio analysis drafts will be released in the fall of 2012 for a public comment period. Then, final recommendations will be made such that reorganization plan funding can be included in the President’s FY2014 budget. Dr. Susan Weiss, Acting Director, NIDA Office of Science Policy and Communications, was the final panel presenter. She noted that nonmedical use of prescription pain medications now is second only to marijuana abuse in terms of prevalence, and highlighted a recent Centers for Disease Control alert on opioids documenting that hospital treatment admissions and opioid related deaths had more than quadrupled over the past decade. She indicated that NIDA is taking a lead on supporting a planned “Call to Action” by the United States Surgeon General to reduce opioid pain medication abuse. In terms of funding issues, Dr. Weiss noted that as with other Institutes, NIDA grant application success rates have been lower due to increased numbers of grant applications and reduced funding levels. NIDA is seeking to protect young investigators and has been funding K awards with higher priority scores, and is reaching beyond pay lines to fund promising investigators and ideas. Dr. Weiss made a special note of the NIDA budget allocation to pharmacotherapeutic development, which was 12% of the total budget this past year. She indicated that NIDA’s funding in this area has been stable for a number of years and pharmacotherapeutic development is not occurring to the exclusion of other research areas. She mentioned a number of priority areas for NIDA including prevention research, clinical trials for a nicotine vaccine and for a new opioid addiction treatment, studies of the medical consequences of addiction, and neuroimaging biomarker studies. She also noted that NIDA is supporting efforts to increase access to large datasets such as the functional connectomes project, which includes more than 2000 resting state functional MRI datasets. Increasing access to these and other datasets could help principal investigators by enabling them to work with data generated by others, resulting in substantial cost savings since subjects would not have to be recruited. The session ended with a short Open Discussion including 2 questions. The first question focused on the apparent bias of NIH peer review committees identified in the Ginther report (published in Science in August)—showing that African American applicants have a statistically significant disadvantage in receiving NIH awards. Dr. Richard Nakamura, who became Acting Director of the Center for Scientific Review in September, commented that NIH is concerned about this issue and is investigating it. The second question focused on whether there is active management for “distributing the wealth” away from Principal Investigators with multiple research project grants to others, particularly young investigators making the transition from K award to independent funding support. Dr. Landis commented that former NIH Director Zerhouni identified this as a vulnerable transition time. The only Institute with an explicit policy on this issue is NIGMS, which requires its Council to specially review and approve funding of PIs with award that would total more than $750,000 per year. There has been discussion of this issue by Sally Rockey in her blog Extramural Nexus, which can be found here. CPDDBLOG welcomes CPDD member's thoughts on these issues. Part 3 of a 3-part follow up. Part 1 can be found here and Part 2 can be found here. Since the NIH formally was established in 1930, the average life expectancy of Americans has increased by almost one-third, from 59.7 to more than 78 years. While many societal changes have contributed to this increase, the contribution made by NIH-funded research in several major disease areas, cardiovascular disease, stroke, cancer, and diabetes, has been linked to this increase in a 2009 study entitled “NIH funding trajectories and their correlations with US health dynamics from 1950 to 2004”. The study, authored by Ken Manton and collaborators and published in the Proceedings of the National Academy of Science, also noted a substantial overall economic benefit of NIH research funding, which increased gross domestic product, increased tax revenues, and reduced Medicare costs (as a consequence of improved public health). The overall economic benefit of NIH-funded research was projected to be $885 billion over a 10-year period and in 2006 was estimated at $36 billion. By contrast, the entire fiscal year 2006 NIH budget was $28.7 billion. This means that American taxpayers were getting a 25% rebate for every dollar appropriated to NIH that year. NIH budgets have been close to $30 billion per year for several years, so, if the Manton report projection is accurate, then the rebate to Americans over the 10-year projection period is on average substantially more than 25% per year. Thus, NIH research has and is projected to continue to more than pay for itself, and it is a great value for American taxpayers. Other studies also have shown that NIH is an economic engine. Take for example the human genome project. This multi-year program was designed to map human genetics and advance research into the genetic underpinnings of human diseases, to improve treatments for the many disorders linked to genes. The cumulative financial contribution provided by NIH to the program (approximately $8 billion, amounting to more than 75% of the total federal funding of over $10 billion), led to an economic impact between 1988 and 2010 of $796 billion, according to a Batelle report entitled “Economic Impact of the Human Genome Project” published in May 2011. Another study entitled “An Economic Engine”, authored by economist Everett Ehrlich and sponsored by United for Medical Research reported that in 2008, NIH activities resulted in over $84 billion of wages in the medical innovation sector. The report also noted that in 2010, NIH investment resulted in over $68 billion of new economic activity. So, over many years, NIH, by funding a broad range of research across many disease areas, including projects that initially were of interest primarily from a basic science perspective, or were considered risky, or even some projects that seemed only remotely related to overall public health when first reviewed, has been a leader in and catalyst of scientific discovery. NIH-supported research has stimulated innovation, has been very successful at reducing disease burdens and increasing quality and length of life, and has stimulated our economy. One could conceptualize NIH as a large index mutual fund designed to capture many winners by investing broadly, since when it comes to science, just like when it comes to investing, it is very hard if not impossible to predict winners at the outset. By encouraging risk in research but investing broadly, risk is mitigated and the American public wins time and time again with their investment in NIH. Billionaire conservative businessman Mr. David Koch has been quoted in the New York Times (Cancer Research Before Activism, March 4, 2011) as using this type of investment strategy. Mr. Koch, a prostate cancer survivor, explained his reasons for distributing $200 million worth of contributions to multiple cancer research centers, including a $100 million donation to fund the David H. Koch Institute for Integrative Cancer Research at the Massachusetts Institute of Technology. He noted that he had been supporting cancer research widely because a broad investment strategy enabled him to pick a winner in the Kentucky Derby: “I bought a ticket on every horse in the race”. Americans must generously invest in NIH to place our bets widely and ensure that we will discover many winners. There are many programs American taxpayers support today and many programs are struggling in these lean economic times. Nonetheless, I urge Congress to support NIH and to consider increasing NIH funding, which virtually is certain to provide a handsome return both in terms of public health improvements and economic stimulus to American taxpayers over time.